East Petersburg, PA. Brian Ruth from the Pocono Mountains in Pennsylvania is one of 18 chainsaw carving artists profiled in a new book The Art of Chainsaw Carving, An Insider’s Look at 18 Artists Working Against the Grain. He is a gregarious showman who razzle-dazzles a crowd while carving realistic wildlife with a high performance chainsaw. Art of Chainsaw Carving will be available for sale in October from all major bookstore chains, from online booksellers and in specialty retail stores. Art of Chainsaw Carving tells the story of the development and evolution of chainsaw carving, celebrates the early artists and profiles contemporary artists like Brian Ruth. 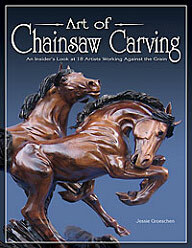 The book includes a directory of major national and international chainsaw carving events – chainsaw carving competitions draw hundreds of artists and thousands of spectators. A graduate of Villanova University, Brian laughs, “I thanked my dad for the education and announced I was going to be a chainsaw carver.” He put his business degree to work as demand for chainsaw performance grew beyond what he could do – forming Masters of the Chainsaw in 1992. Since then, 60 carvers placed by his company have provided people-pleasing performances at nearly 1,600 events. Visit http://www.mastersofthechainsaw.com/ Art of Chainsaw Carving is published by Fox Chapel Publishing will be available for sale in mid-September in local bookstores or online. Fox Chapel Publishing Co., Inc. is one of the nation’s leading resources for woodworking books and magazines with offices in East Petersburg, PA. Fox Chapel publishes two magazines: Wood Carving Illustrated and Scroll Saw Woodworking & Crafts; more than 200 book titles; and distributes more than 1,000 woodworking books from other publishers around the world. Visit www.FoxChapelPublishing.com.